Oops, I almost forgot that today was Wednesday and time for me to jot a little something down in my blog again. I’ll blame it on the fact that I was out of my normal routine for today. I didn’t get to go to Morning Watch because Jason had to work in Louisville and leave the house before I would get back home. And so began the Wednesday where I felt mostly out of sorts, if I can use that phrase for what I mean. I didn’t do things the way I normally would like to. I was so sleepy and was not ready to get out bed. But Judah and Bella were up, and Jason was leaving, so I easily gave in to Judah’s persistent request to watch something on tv. My plan was to lay down on the couch, under the warmth of my new electric blanket Jason got me, and rest until the movie they picked out was over. But by the time I atually got to make it to the couch, I was awake and decided to do some journaling instead of resting. Last night Jason bought me a special journal to use for writing through the loss of Arianna and to record the story of her life. I have come across several instances of people writing, or encouraging to write, to help through the process of grieving, so I decided to give it a try. So last night we went to Barnes & Noble to shop for one…and we also thought it would do us some good to just get out of the house and let the kids play at the Lego and train table. I quickly ended up with a whole stack of journals that seemed worthy enough for the purpose, but ended up not getting any of those. 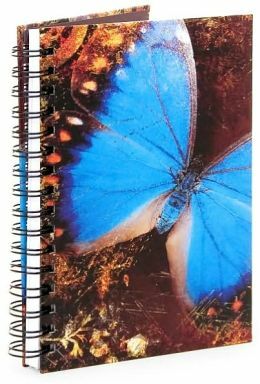 I had searched around for any and all journals that had a picture of a butterfly because I discovered it is a common symbol used for a pregnancy loss. A butterfly represents a short life – the butterfly transforming from caterpillar (life) through chrysalis (death) to butterfly (resurrection) in only a short space of time. I didn’t find any, but while I was going through several others, Jason came to me with one he had found. It was spiral bound, like what I was wanting so I wouldn’t have to deal with a rigid binding that makes it difficult the write, and it had a single butterfly on the cover — simple and beautiful in the color of the flowers we have chosen to plant in honor of our daughter, forget-me-nots. He didn’t know anything about the symbol of the butterfly, he just saw it and thought it might mean something special to me, and it did. So this morning I started writing my way through all my emotions, and I think it really is helping. To be able to express, in complete freedom, the way I feel is, in fact, very healing. It is bringing me face to face with my true feelings so that I can recognize them, deal with them, and heal from them.